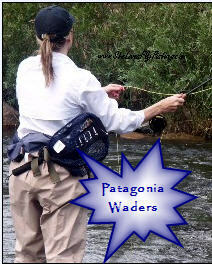 One of the first things you'll need to purchase is your fly fishing waders for women. Get this wrong and you'll be uncomfortable every time you go out! Up until this last fishing trip I’ve had waders so ill fitting that I could have carried a purse in the crotch of those uncomfortable things. The 100% nylon inter-shell crotch came down to my knees – plenty of room for car keys, a water bottle, some chap-stick. I didn't follow the fly-fishing basics and size myself properly. The proprietor of the fly shop that sold me these beauties apparently cared more about moving his stock than he did about fitting me. They were made for a small, short legged man - not a long legged woman. And they felt heavy. Enter Will Sands - Basalt Colorado’s Taylor Creek Fly Shop. All I had to do was walk up to the general wader area and Will took over and made life easy. He commiserated with my purse-in-the-crotch story, and quickly offered a svelte pair of Patagonia 100% polyester WaterMaster Fly Fishing System waders. Waders with a sassy black belt. Wader belts can be sassy – and they can save your life if you fall in the river. I’ve done that more than once - sassy black belts are good. Then Will found the perfect pair of boots for me by reversing the theory – let’s go look at smaller men’s boots to fit you better. The Orvis Ultra-light Wading Shoes felt light and tight – loved them. Everything delivered beyond expectations! I can sit in the river in these waders and be dry and comfortable with no thigh pinch. (If you get over-heated on the river - have a seat for a moment and cool everything down). Lots of leg room without looking baggy. Cinch at the waist and roll down the shoulder straps if you need to stay cool. Will then helped me select my polarized sunglasses and my shopping trip was a hands-down success. Taylor Creek – good ‘Guides’ in and out of the shop! How do I buy the right sunglasses for fly fishing?